Pattaya is a resort city on the east coast of the Gulf of Thailand, about 100 kilometers from Bangkok city. Pattaya city is a self governing municipal area. Pattaya is the center of the Pattaya-Chonburi Metropolitan Area—the conurbation in Chonburi Province—with a total population roughly 1,000,000. Pattaya has become a city that is loved by tourists. Pattaya offers beautiful serene beaches, adventure sports and also a very happening nightlife. The Pattaya bay area is one of the largest bay areas in all of Asia. Pattaya city is the second most visited place in Thailand next only to Bangkok. The name Pattaya evolved from the march of king Phraya Tak from the capital Ayutthaya to Chanthaburi, which took place before the fall of the former capital to Burmese invaders. When his army arrived in the vicinity of what is now Pattaya, Phraya Tak encountered the troops of a local leader named Nai Klom, who tried to intercept him. When the two met face to face, Nai Klom was impressed by Phraya Tak’s dignified manner and his army’s strict discipline. He surrendered without a fight and joined his forces. The place the armies confronted each other was thereafter known as “Thap Phraya”, which means the “army of the Phraya”. This later became Pattaya, the name of the wind blowing from the south-west to the north-east at the beginning of the rainy season. Pattaya was a fishing village till the 1960’s. Then everything changed when American soldiers came to Thailand for the Vietnamese war. The entire situation of Pattaya changes when a group of 500 American soldiers were taken to the south beach of Pattaya. They enjoyed their stay and raved about the place. Quickly Pattaya became a hot alternative to Bangkok. Pattaya on the gulf of Thailand is approximately 160 kilometers south of the city of Bangkok in Bang Lamung district. It spreads over an area of approximately 208 sq km with a 15 km long and scenic coastline. Nearest international airport from Pattaya is Suvarnabhumi Airport in Bangkok and one can reach Pattaya from the airport just in two hours. The city sits parallel to Sukhumvit Road on its east and the coastline on its west. The town has high mountains to the south and plain on the coast. Eastern region slopes down towards the sea on the west. Coastal Pattaya can be segregated into five sub-districts – North Pattaya (Pattaya Nua), South Pattaya (Pattaya Tai), Central Pattaya (Pattaya Klang), Buddha Hill (between South Pattaya and Jomtien Beach) and Naklua (just north of North Pattaya). Planning and timing your tour to a country is very important. If you do not takes the country’s weather conditions under consideration, then your vacations could be marred. Always visit the country at the best time possible. Pattaya has a tropical wet and dry climate, which is divided into the following seasons: hot and dry (December to February), hot and humid (March and April), and hot and rainy (May to November). Thailand, or Pattaya in particular, is known for tropical climate and you could visit the place any time in the year, save the rainy season, which is from July to October. However, it is not that travel in the rainy season would keep your tour totally in disarray. In Thailand, rain is not permanent. It comes, has quick burst and goes. The only thing is, you can’t guess its timing. In summer, Thailand is bit hot. November to February is the coolest time of the year. The rain is comparatively less than other times in the year. Pattaya is at a distance of 122 kilometers from Suvarnabhumi international airport, the largest international airport in Thailand. It takes about 2 hours to reach Pattaya from the airport. One can book a seat in the common public transfers which are regular from the airport to Pattaya. There are flights from all major Indian cities to Suvarnabhumi airport. Air India, Malaysian airlines offer the cheapest flight options. One can travel from India to Pattaya via sea as well. There are ferries from Kolkata and Chennai to Bangkok periodically. While travelling via sea, while the fare of the trip is extremely less, the time taken to travel increases. A ferry from Kolkata passes through the bay of Bengal and Andaman sea. It then transverses through the strait of Malacca and passes through the sea of China to reach the gulf of Thailand and from there it proceeds to Bangkok. The total distance travelled is 2894 nautical miles. From Bangkok, take a cab or taxi and head towards Pattaya. This journey takes about 2 hours. Then fill out the required forms and pay an amount of 500 processing fee. The validity of IDP lasts for about a year from the issued date. 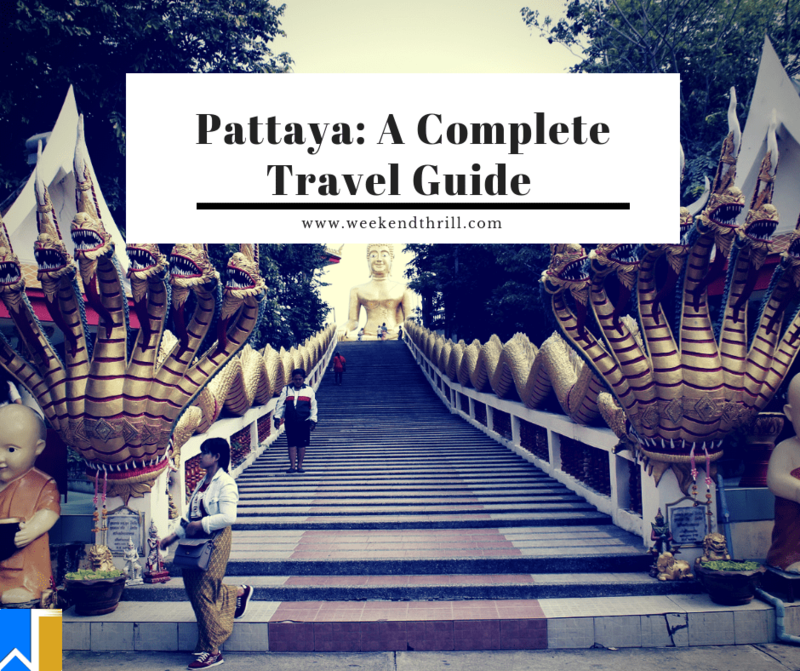 After reaching Bangkok, Pattaya is at a distance of 150 kilometers and it takes about 2 hours to get there by road. Made entirely of wood (without any metal nails) and commanding a celestial view of the ocean, the Sanctuary of Truth is best described as a visionary environment: part art installation, religious shrine and cultural monument. Constructed in four wings dedicated to Thai, Khmer, Chinese and Indian religious iconography, its architecture and setting is impressive. A popular stop for tour groups, this museum contains more than 300 impressive pieces of Chinese artwork, mainly bronze and brass statues depicting historical figures as well as Buddhist, Confucian and Taoist deities. Founded by Sa-nga Ku Kobkiat, a Thai national who grew up in China, the museum was intended as a friendship-building project between the two countries. This hill has a modest Buddhist temple as well as a much-revered memorial to the admiral who founded the modern Thai navy. There are marvellous views over the Pattaya bay and a little cafe terrace from which to enjoy them. Sunset is a particularly spectacular time to be here. Just off Pattaya in the Gulf of Thailand is Koh Larn, also known as Coral Island. Measuring four kilometers long and two kilometers wide, the island boasts beautiful beaches with clear waters and a hilly, forested interior. Besides swimming and relaxing on the beach visitors can also ride a jet ski or banana boat, go snorkeling or kayaking or take a hiking trip in the islands forested interior. A dazzling show with energetic acts, bright colors and extravagant costumes, the Alcazar show is an entertaining evening for people of all ages. The show takes you through different countries and their cultures. During the 70-minute show you will see a good variety of acts including Korean K-Pop, Persian, Chinese, Indian, Thai and Russian. Nong Nooch tropical garden close to Pattaya is the largest botanical garden in South East Asia. The vast gardens are set in an area of around 600 acres, that originally was to be used as a plantation to grow local fruits. The area was then first turned into a garden for conservation of certain species of plants and flowers, and was later opened to visitors. In the gardens you will find an enormous number of plant and flower species in a particularly well kept environment. The best way to experience Thailand is to do it with all of your five senses. The most enjoyable way is through the taste of the local Pattaya food. Pattaya is a multicultural place attracting Thai people from all around, each bringing their own cuisine and food. The coastal city of Pattaya also enjoys fresh seafood caught in the gulf of Thailand. Different ingredients are used for preparing food that is good in its flavor and offers large scale medicinal benefits. Proper care is also taken in offering food the right smell, context, and appearance. Here is a list of the dishes of Pattaya to help you eat like a local. A combination of living museum, live show and shopping centre, Pattaya Floating Market is an extremely popular attraction as well as being a great place for souvenir shopping. Being an artificial reconstruction of the popular floating markets in Bangkok, it is considerably safer and easier to navigate and is home to a great selection of high quality wares such as clothing, handicraft, art and jewellery. There is also the option to scoot around the stilted village in a small boat, enjoy some of the cultural demonstrations or dine at the great selection of small eateries offering Thai meals and snacks. If you want your holiday souvenirs to be made by actual local craftsman instead of in a giant factory, then OTOP is the perfect place to go to. It is a part of the government initiative to support local craftsman and community. The wares in OTOP come in from all around Pattaya. The goods sold here are of high quality. What was once a rag-tag collection of street stalls under a stifling corrugated metal roof is now an air-conditioned edifice containing a good selection of stalls selling wares ideal for tourists. Also known as the “Made in Thailand Market”, the vendors within sell everything from discount clothing and souvenirs to mobile phone accessories and small electrical gadgets – basically, everything you would normally find in a street market, with a few bonus extras like tailor shops and luggage stalls. Pattaya is a resort city, so the prices are also a bit on the expensive side. Make sure to pack swimsuits for your fun day at the beach. Pack extra sunscreen for protection against the harsh rays of the sun.